Take a fascinating journey and experience the many facets of footwear: its evolution and symbolism through the ages, the methods and materials of its manufacture and its place in our imaginations. 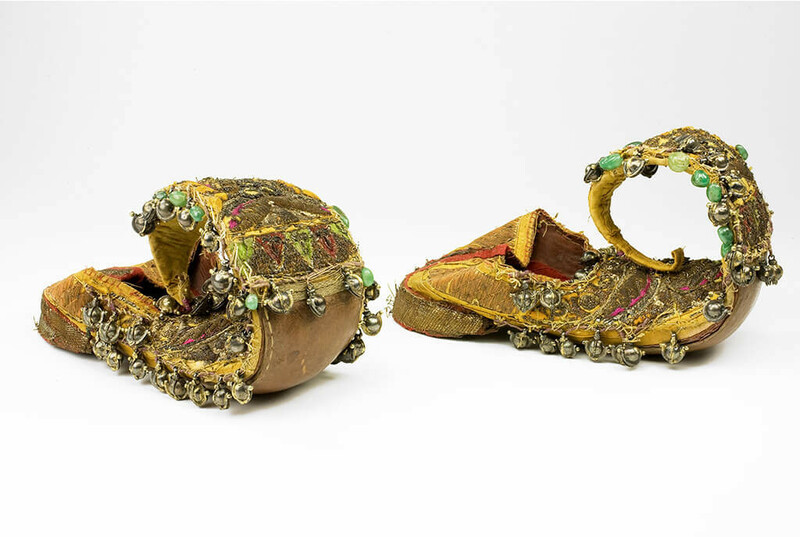 The BSM’s flagship exhibition, All About Shoes: Footwear Through the Ages, is a voyage through four and a half millennia of shoes. 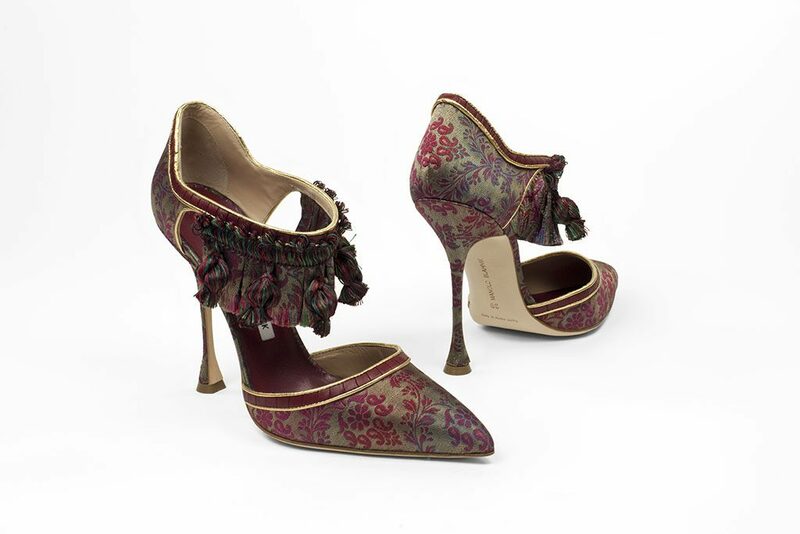 As well as presenting an engaging overview of the history of footwear, All About Shoes also explores the wider context of our fascinating collection. The Bata Shoe Museum currently holds over 13,000 shoes and related artefacts, spanning 4,500 years of footwear history. This extraordinary collection is central to the museum’s mission and enables us to mount dynamic and changing exhibitions. With only four percent of the collection typically on view at any given time, the rest of our artifacts are maintained in two specially-designed subterranean vaults, which keep the collection safe and secure while facilitating research and conservation by staff and visiting scholars. This section of the All About Shoes gives you a visitors a peek into this seldom-seen aspect of the museum’s work. 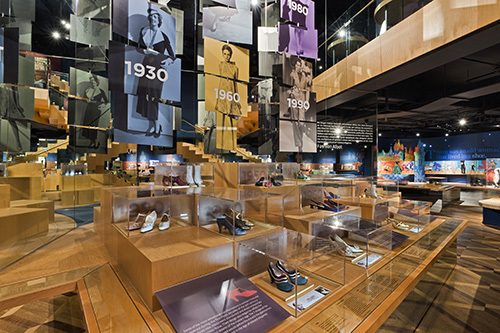 Fashion returns to the Bata Shoe Museum with an exciting area dedicated to style in our All About Shoes gallery: Fashion Afoot, a compelling look at the development of fashion shoes in the 20th century. No longer hidden beneath voluminous skirts, in the last century the shoe emerged as an essential fashion accessory. Its ascendancy in the fashion world also lifted the cloak of anonymity from the shoe designer. The result: from the 1920s, footwear visionaries profoundly influenced all elements of fashion – and became celebrities in their own right. You will be able to see how much shoes changed. decade by decade, in response to design, politics, and social change. Both fashion and function are explored in What’s Their Line. Offering an in-depth look at footwear with a purpose, What’s Their Line features shoes that are both ordinary and extraordinary. The most practical reasons for donning specialized footwear have always been to protect feet from injury, to enable us to do a better or easier job, or to improve our performance. Around the world and throughout history, footwear has been designed in amazingly diverse ways to satisfy these needs. 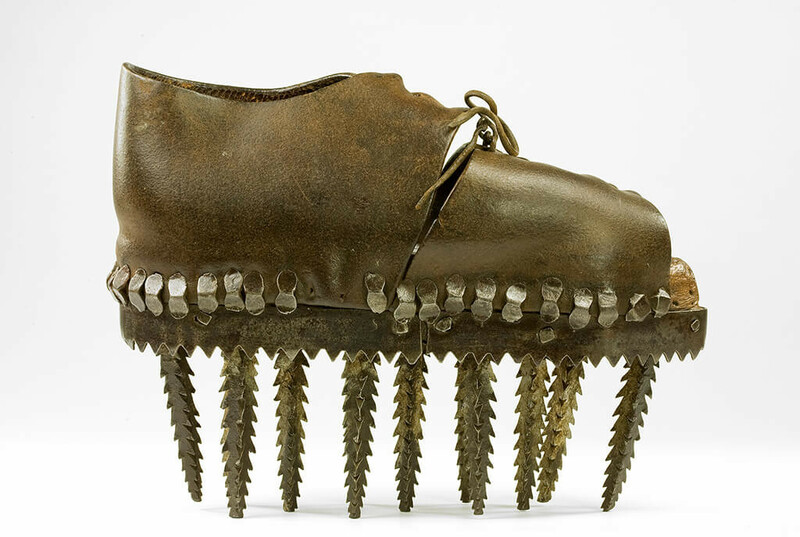 Shoes that serve as tools are remarkable and fascinating inventions. No matter how limited the applications might be, appropriate footwear is essential in many jobs. And keep in mind that these seemingly ordinary shoes have altered the way we work, think and live over the past two centuries. Amongst our incredibly varied collection, chestnut-crushing clogs from France and sumo wrestler’s geta from Japan are particularly unmissable! Did you know that the BSM has a streaming audio guide for this gallery available to all visitors free of charge (in English and in French)? Click here for more information. For media or image requests please contact Nicole Cahill, Marketing and New Media Manager at 416-979-7799 x 239 or nicole@batashoemuseum.ca. 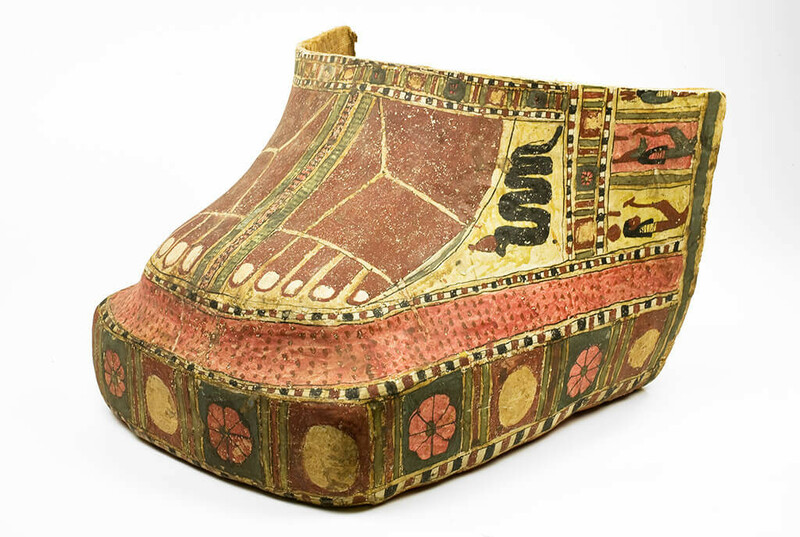 The surfaced of this rare piece of Egyptian cartonnage has been painted to draw viewer's attention to the feet and sandals of the deceased. The underside features painted sandals soles. This pair of saffron coloured mojaris was worn by a temple dancer in Rajasthan. They feature gold zardo embroidery and the jade beads and brass bells would have created a beautiful tinkling sound when the wearer danced. Manchu women were forbidden to have bound feet and instead wore high platform shoes that stilted their gait and allowed them to emulate the desirable shuffling ‘lotus walk’ of women with bound feet. 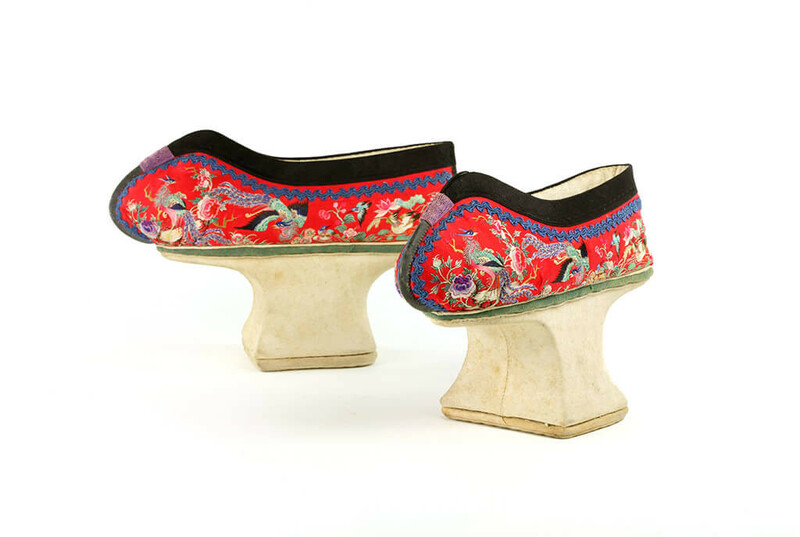 Although the Manchu and the Han were distinct ethnic groups within China, they shared a similar artistic vocabulary, a fact attested to by the use of similar motifs such as the butterflies that decorate the uppers of these shoes. Platform footwear called chopines were a staple of upper-class women's fashion in Italy and Spain in the 16th century. 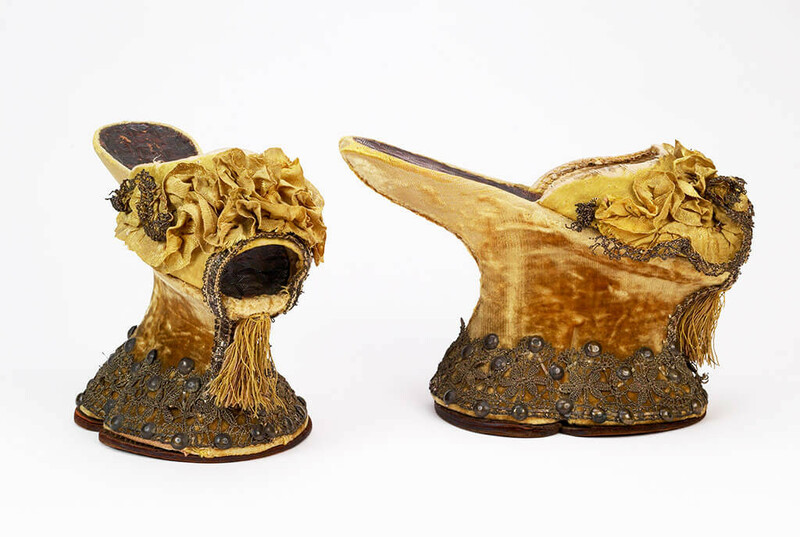 In Italy chopines were made of wood and worn hidden under long dresses, while in Spain they were made of cork, highly decorated and worn visible. These chopines share similarities with both Italian and Spanish styles and comes from a part of Italy ruled by the Spanish. Spanish designer Manolo Blahnik (1942 - ) has been dedicated to the art of shoemaking since the 1970s. His work is often inspired by the elegance of the past which he translates into objects of desire for the present. This pair of Locka’s was gifted to the museum by Mr. Blahnik in 2014. It remains one of his favourite shoes of that season.